Many paraplegics/quadriplegics love the feeling of being in the water...it's a physical sensation, a sense of freedom. On land, we cannot walk but in the water it is as if we can dance. "The Waterdance" is one of the most realistic films ever released dealing with the subject of adjusting to life with a spinal cord injury. This realism is no surprise when you consider that the film is written and co-directed by Neal Jimenez, himself paralyzed in an accident in 1984. The film initially connected with me almost solely because of the seemingly cosmic circumstances of the film's plot. First, the film's central character, Joel Garcia (Eric Stoltz), is a writer (as was I when I went from walking with crutches to a wheelchair). Secondly, when the accident occurs Joel is involved with Anna, his publisher and married girlfriend (played by Helen Hunt). Finally, in the film Joel's actions offered mirrored my own actions...how he responded to help, how he responded to psychiatry, how he responded to poor treatment and writing and embarrassment and relationships. Even Joel's appearance was much like mine...a receding hairline, goatee and numerous scars that give a rugged yet decent look. For these reasons, my first viewing of "The Waterdance" was an intensely emotional experience. It was a cathartic film in that it allowed a processing of all the emotions that surrounded my own disability, my own insecurities and fears and dreams. "The Waterdance" features stellar performances by its entire cast. Stoltz, as Garcia, gives a performance unseen by him anywhere else. It was this film that made me truly realize how good Stoltz could be with the right material. 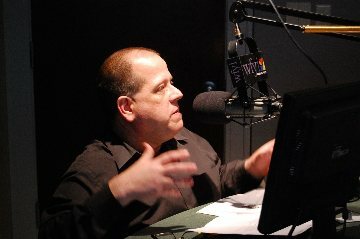 Stoltz has always struggled a bit due to his rather flat affect, however, in this film he uses it to his advantage...whether it's a quiet rage or intense desperation, Stoltz is on target here with every aspect of his character including, largely, the physical acting involved in portraying a character with a spinal cord injury. The film takes place largely in a rehab center, and it deals without hesitation in all areas of these people's lives. From the opening moments of dealing with one's own disability to being surrounded with a wide variety of successes and failures...to dealing with the changing dynamics of a relationship following a new disability...to trying to sort out "Can I still do my work? "...to the anger and frustration of being in a rehab center for so long and dealing with a medical system that can save you but treats you like a piece of meat in the process...every aspect of this film plays remarkably true to life. The film also features an outstanding performance by Wesley Snipes, and I'd say once again possibly the performance of his career. As Raymond, Snipes is, perhaps, the most hopeless of the bunch. He's losing everything (friends, wife, child), and often sabotages his own success through lack of self-care. He ends up in a nursing home at one point, but like many individuals who suffer a spinal cord injury, the pay off for becoming a victim seems greater than the idea of fighting for independence and/or fighting for a life he's not even sure he wants. The film addresses even the legal aspects of disability and injury in the character of Bloss, played by William Forsythe. Bloss may well be set for life due to the accident, however, in very vivid imagery he has to come face to face with the fact that he may have been, at least partially, responsible for the accident that left him paralyzed. Forsythe's performance as a bitter, racist biker is powerful and intense yet remains oddly sympathetic. Likewise, William Young, Elizabeth Pena and Tony Genaro all offer finely tuned performances in smaller roles. What caused "The Waterdance" to fall out of my #1 slot? As time moved on and I began to be able to watch the film with a more critical eye, I became acutely aware of the occasional disconnection in the plot line...at times it worked, but at times it didn't. There were also scenes that seemed to be intentionally included solely for dramatic impact rather than a true flow with the story...an example would be a confrontation that Joel and Bloss have with the hospital's telephone operators. It felt unnecessarily histrionic and completely disruptive to the atmosphere of the film. When I choose a favorite film, it's more than a film that is technically perfect. It's more than a film that makes me think or feel or even act. It's a film that, somehow, manages to change me...it influences my life on some level and rather than make me feel...it changes the way I feel. Rather than making me think, my favorite films change the way I think. 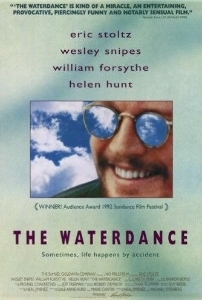 "The Waterdance" was, and remains, a life-changing film for me because it embraced the experience of disability on a level that I'd not seen before. It didn't portray us as heroes or victims, but as human beings trying to live, laugh and love like everyone else. Jimenez acknowledged that the film was based upon his own experiences, and it shows. The commitment of the cast also shows in giving the most precise, truly outstanding performances I've seen from Stoltz, Hunt and Snipes. Ever so often, I crave being in the water. I crave the freedom within my body to feel whole and complete. I crave the feeling that I can dance. It is during these times that I find myself sitting down in front of my television and watching "The Waterdance." It reminds me that life isn't about being "able" to walk, but about being willing to dance.